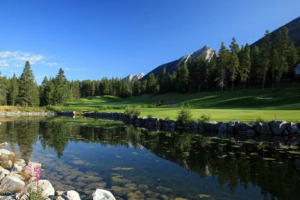 As with golfing elsewhere in the Canadian Rockies, book all tee times well in advance, but also try to be flexible, because two of Canmore’s three courses offer weekday and twilight discounts. The golfing season in Canmore runs early May to late September. Silvertip (403/678-1600 or 877/877-5444, www.silvertipresort.com) opened in summer 1998 on a series of wide benches between the valley floor and the lower slopes of Mount Lady Macdonald. It was quickly recognized as one of Canada’s finest resort courses, but more tellingly, it boasts a slope rating of 153, the highest of any course in mainland North America. Needless to say, the layout is challenging, with the most distinct feature being an elevation change of 200 meters (660 feet) between the lowest and highest points on the course. Adding to this challenge are narrow, sloping, tree-lined fairways; numerous water hazards; 74 bunkers; and a course length of a frightening 7,300 yards from the back markers. High-season greens fees are $195, which includes a mandatory cart and use of the driving range. Stewart Creek Golf Club (4100 Stewart Creek Dr., 403/609-6099 or 877/993-4653, www.stewartcreekgolf.com), another newer layout, lies across the valley in the Three Sisters Mountain Village development. It is shorter than Silvertip but still measures more than 7,000 yards from the back tees. The fairways are relatively wide, but positioning of tee shots is important, and the course is made more interesting by hanging greens, greenside exposed rock, and historic mine shafts. Greens fees are $175 to 195, with twilight rates of $125. These rates include use of a power cart and practice facility. Canmore Golf & Curling Club (403/678-4785, www.canmoregolf.net), built in the 1920s as a nine-hole course at the north end of 8th Avenue, has developed into an 18-hole course with a modern clubhouse and a practice facility that includes a driving range. It is an interesting layout, with scenic panoramas and water on some holes. Greens fees are $82.50.